From 2003 onward, any books written about television shows have to cover the landmark that is Ricky Gervais and Stephen Merchant's absolutely fabulous workplace comedy, The Office, or be considered woefully lacking. The international award-winning program has not only been remade in numerous countries, but its mockumentary-style has been used in a number of recent sitcoms, such as Modern Family. The premise is that a documentary crew interviews office workers and films the daily goings-on in the Slough branch of the Wernham Hogg Paper Company. The branch manager is David Brent (Gervais), a boss who very desperately tries way too hard to be everyone's friend. He frequently though unintentionally says and does something inappropriate that will have viewers in alternating fits of laughter and discomfort. At first, David comes off like a bit of a jerk and a buffoon, but over the course of the 12 episodes and two Christmas specials, Gervais and Merchant reveal a very complex character, one of television's most memorable not just from the past decade but of all time. David hides his feelings of inadequacy under a thin veneer of faux coolness that easily crumbles away at the slightest bit of prodding. This is revealed in the opening moments of the first episode, "Downsize," when David reacts harshly toward receptionist Dawn Tinsley (Lucy Davis) when she playfully joins in his self-deprecation for the camera about his drinking. The Office is filled with an interesting collection of characters. The show's other main character is Tim Canterbury (Martin Freeman), who is frustrated by his life. He's unsatisfied working as a paper salesman, he is 30 and lives with his parents, and he has a great affection for Dawn. Unfortunately for him, she is engaged to warehouse worker Lee (Joel Beckett) yet the attraction between the two is obvious to everyone. Amidst the frequent chaos, Tim looks into the camera with very funny deadpans as if to ask if anyone else is witnessing the craziness that is taking place. One thing that brings Tim and Dawn closer together is their time playing pranks and teasing Gareth Keenan (Mackenzie Crook), who annoyingly goes on about his volunteer military service and way with the ladies. He also overexerts what little power he has as "Assistant to the Regional Manager," which he always abbreviates to the more prestigious "Assistant Regional Manager." During Series 1, there is a constant concern about the possible merging of branch offices with Swindon and loss of jobs. David lies to the employees and his boss in an attempt to keep up morale and avoid confrontation. During Series 2, the merge happens with some of the Swindon employees coming to the Slough and David's counterpart Neil Godwin (Patrick Baladi) becoming his supervisor. On top of that, Neil is a better manager, is liked better by the employees, and is very good looking, so David frequently clashes with him. The Swindon branch also brings a rival for Dawn as Rachel (Stacey Roca) begins to date Tim. The Christmas Specials are set three years after the documentary aired on the BBC and catches up with the characters as the new crew reunites them. The Office creates many memorable moments, from hysterically funny to uncomfortably awkward. Though a limited number of episodes, it concludes in a very satisfying way because the growth and changes in the lead characters are very touching. 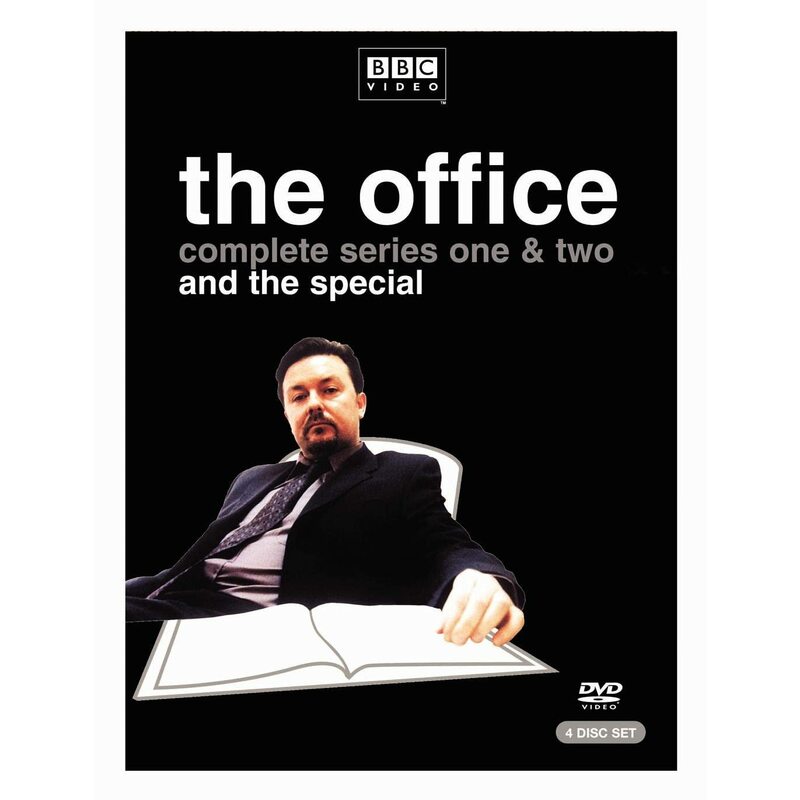 The Office was previously collected in 2004's Complete Collection set and all those features are included. Disc Two has Comedy Connections: The Office, web videos, a documentary, and deleted scenes. Comedy Connections: The Office is a BBC Scotland program from 2007 that looks at the history of the show and those involved. The five web videos are from the interviews sessions seen in the wraparounds. 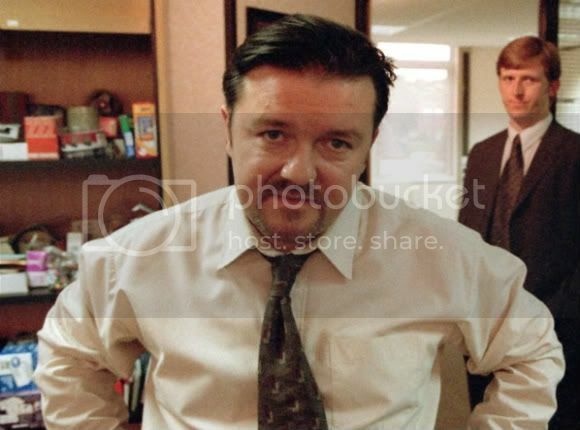 The documentary "How I Made The Office by Ricky Gervais" covers the creation and production of the show. There are six deleted scenes with written commentary by Gervais and Merchant. Wish they could be seen altogether. Disc Three extras are from Series 2: deleted scenes (13 min), outtakes (8 min), and a video diary (20 min) by Gervais and Merchant about making of series 2. Disc Four extras are from the two Christmas Specials and beyond with commentary by Gervais and Merchant on Part 2, the documentary The Office Closed For Business (23 min), Golden Globes Featurette (6 min) where they pulled off an upset with two wins for Comedy and Best Actor for Gervais, the full song and video by David Brent for "If You Don't Know Me By Now", and Making (the electric version) of "Freelove Freeway" (4 min) with guest vocals by Noel Gallagher. New for the 10th Anniversary Edition are episode wraparounds on Disc One for Series 1 with Gervais and Merchant; cast members Davies, Crook, Freeman, and Ewen Macintosh, who plays Keith; and famous fans of the show, such as Richard Curtis, Matthew Perry, and Christopher Guest, whose work in Spinal Tap is one of the most notable mockumentaries. Disc Two has what's labelled "Pilot," though it's not actually the pilot per se. It was shot in 1998, and the faux-documentary is focused on David, whose character is more creepy and unlikable. Many bits are reused for the first episode. Fans should celebrate The Office's aluminium anniversary with this Special Edition if they don't already own it. For those who haven't seen it, if you like to cringe while watching comedy, this is the show for you. You're right, it's a deeply influential show for comedies today. It's fascinating to think about how the fake documentary set-up contributes to the comedic tension -- which The Office UK builds like nothing I've ever seen -- as there's that self-awareness of being on camera as belieable yet hilarious scenes unfold. Love Martin Freeman in this by the way, and the romantic B storyline was just as engaging as Brent and all his antics. I was so happy I got to rewatch this show and experience its genius again. It holds up so well. Aside from David "performing" for the camera, the romance seems most affected by the documentary style as Tim and Dawn's moments together are all played out in front of the camera, so their actions are occassionally blunted as they are aware it may all be seen later on TV. SPOILER: When Tim asks Dawn to leave Lee, he busts out of an interview session and takes her into another room, tearing off his mic and shutting it off while he talks to her. There's a long bit of silence, particularly for a TV show, before Tim turns it back on and reveals the results.